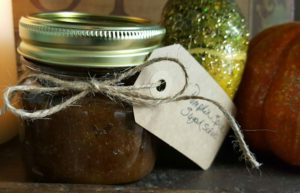 This super-aromatic homemade body scrub is sure to get you into the autumn groove. As a person who has fallen victim to the “more must be better” mindset, let me assure you in advance that when it comes to the use of cinnamon on your skin, more is definitely not better!!! I once added some extra cinnamon to a DIY face mask only to find myself looking like a close cousin to a boiled lobster for several hours after the “treatment”. So, please, though the body skin is tougher than the face – just don’t be heavy handed with your spices! Lastly, this is a body scrub and isn’t appropriate for the delicate skin of your face, neck, and chest. Leave it for hands, arms, elbows, legs and feet. If you have a nut allergy, you can substitute the almond oil for coconut oil. And as always, watch that slippery bathtub floor anytime you’re using oil-based scrubs! Combine both sugars and all spices together in a medium mixing bowl. Add enough almond oil to saturate the mixture without having a lot of excess oil standing over the mixture. Stir mixture thoroughly to combine all ingredients and distribute oil. Store in an air-tight container. Scrub should be used within 2 months. To avoid contaminating homemade scrubs, it’s always a good idea to remove the scrub from your storage container with a spoon or spatula instead of fingers. Join Now and Stay Informed!